As I started working out in the yard yesterday morning I was first greeted by one of those HUGE spiders residing on my newspaper roll. He would not sit still long enough for me to kill him so I tore off the paper he was on and he flew around the yard most of the morning. I finished re-stacking the bricks I used for the base of my compost bin and began shoveling the compost back into the bin. This bin had been broken when I had moved it to its new location about 2 years ago but I had managed to fix it enough so that the one broken sliding door would stay on. After I had shoveled most of the compost back into the bin the door fell off and I could not get it to stay on. 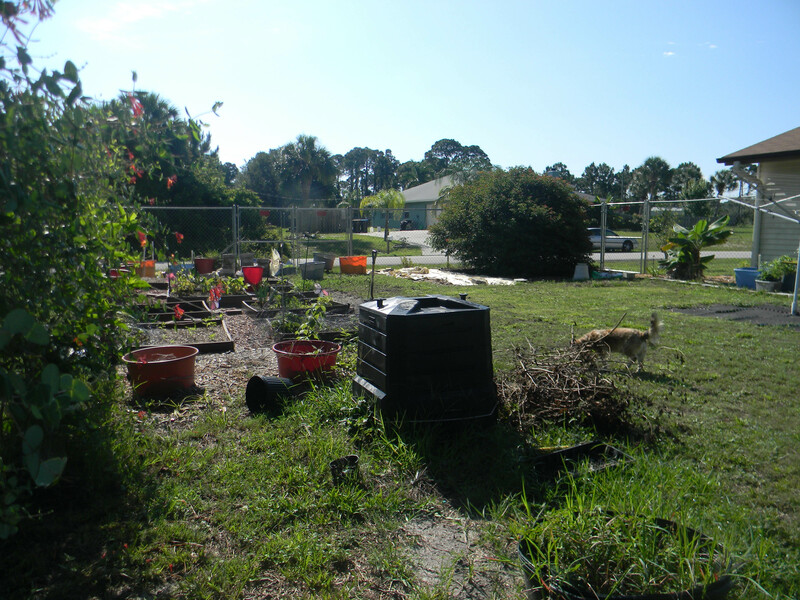 I was in a dilemma, I could buy a new composter or let all my compost sit on the ground and lose it. I came in the house and looked Craig’s list to see if someone might be selling a rotating drum type composter. I have been wanting one but didn’t want to pay over $100. The only one I found was one made (look at the bottom of this page for pictures) by someone in my area. I also looked up the Lowe’s and Home Depot websites. Most of the composters I could afford had poor reviews. 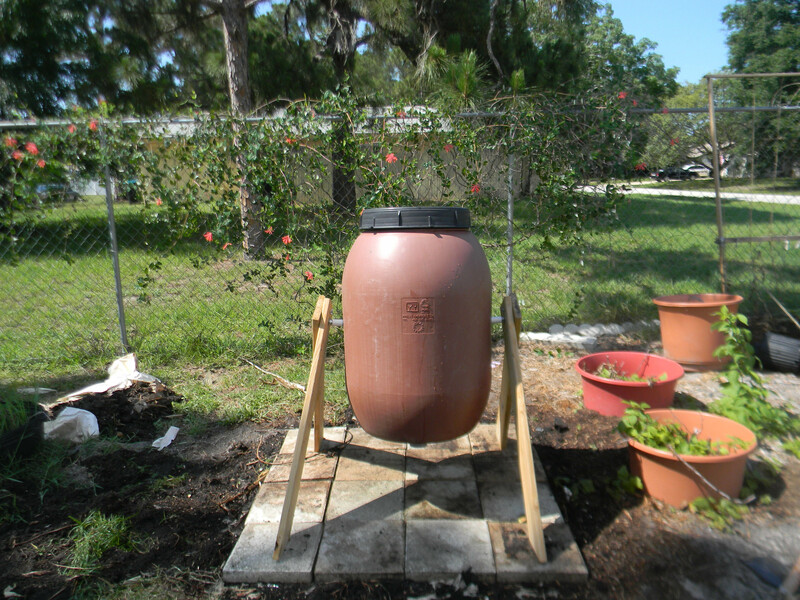 They said when the composter was full and they turned the drum the door would fall off. Not what I wanted. I decided to phone the number on Craig’s List. The maker said he was out of them and would have some in a couple of weeks. I told him I really needed one now as mine just broke. Then he told me that he sold some through a farm up in the Cocoa area called Naturewise. I phoned them and they had a couple in stock so my husband and I drove the 35 minutes to pick one up. I figured if a small farm was selling them they must be OK. I was pleasantly surprised when we arrived. They had cows, lamas, goats and chickens that we could see. They also sell plants, eggs, farm produce, cheese and honey. If you live in the area it is well worth a visit. We were able to remove two of the bolts, fold the legs and fit the composter in my Saturn wagon. The price of this composter was $80 plus tax. This is a great price compared to other composters. I hope it holds up. It is made of a food grade barrel and the wood is decking material. 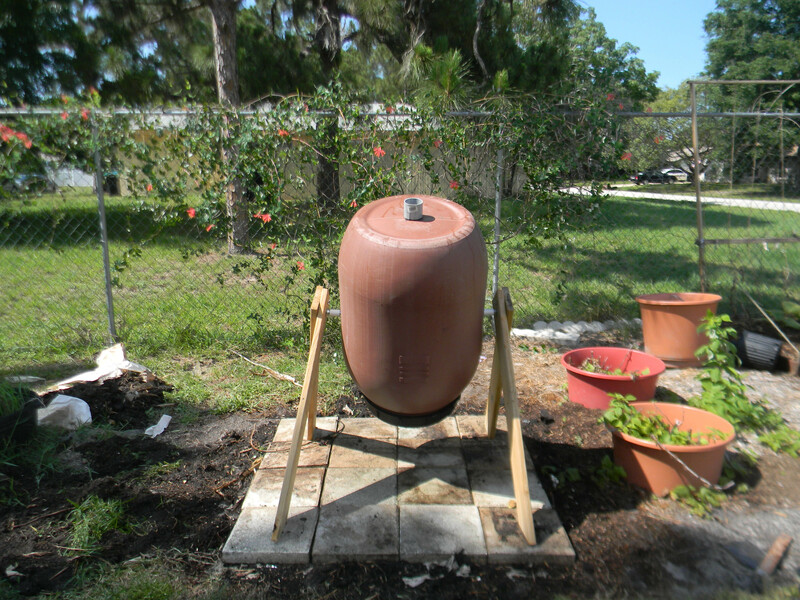 When I arrived home I was able to shovel most of my compost into my new composter. It is a little hard to turn when it is full. Of course I am very tired after 2 days working in my yard and I am only 4′ 11″. I had to get it swinging a bit before it would go all the way around. Eventually I would like to purchase another one. My birthday is in 2 months, hint, hint husband. 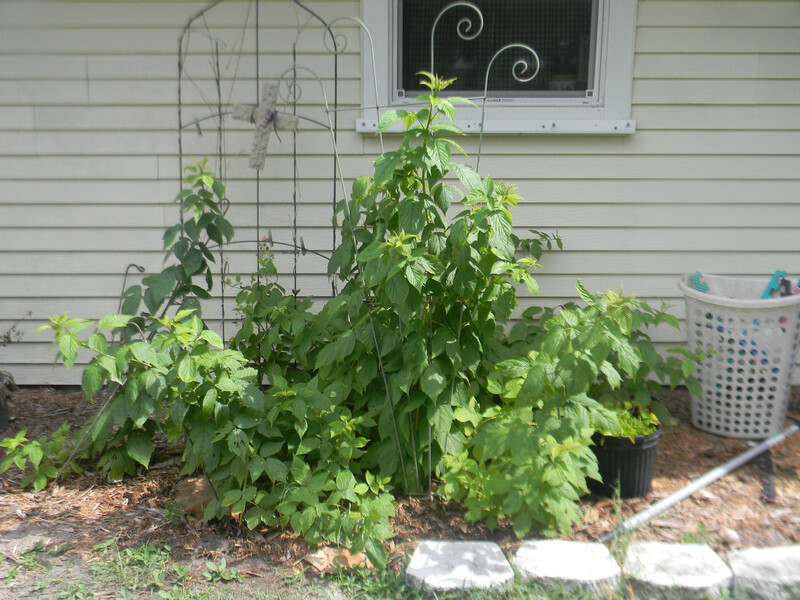 This entry was posted in Gardening, Posts and tagged barrel compost bin, compost, compost bin, composting, gardening. Bookmark the permalink.